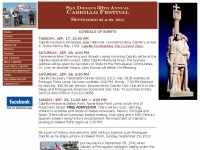 Official website of the Cabrillo Festival, San Diego CA, 2011. Cabrillo Festival, Inc is specified as the websites creator. A profile of Cabrillofestival.org was found on the social network Facebook. The web server with the IP-address 96.127.149.74 used by Cabrillofestival.org is owned by SingleHop and is located in Chicago, USA. There are many websites run by this web server. The operator uses this server for many hosting clients. In total there are at least 144 websites on this server. The language of these websites is mostly english.